T-shirts are available in ADULT UNISEX SIZES. 100% preshrunk cotton. Lettering is on front and back. Rockin' on the Mon! 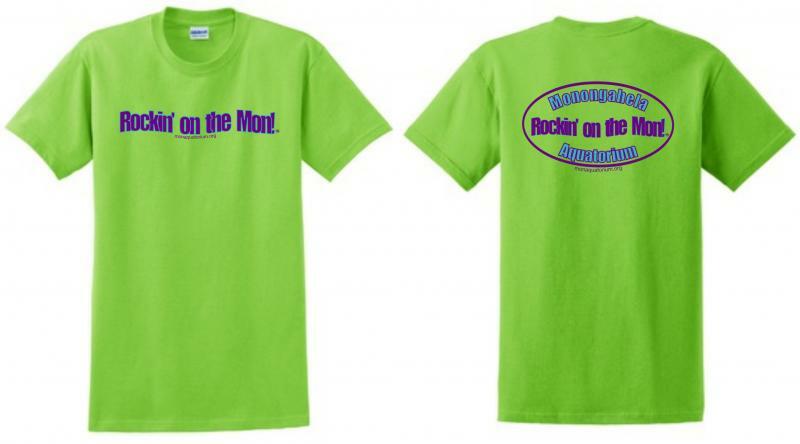 printed on the front - and Monongahela Aquatorium Rockin' on the Mon! on the back. Shirts S-M-L-XL are $12 (EXTENDED SIZES XXL, XXXL ADD $3) plus shipping. T SHIRTS are available at our concerts or here on our site. PLEASE INDICATE COLOR CHOICE IN THE MESSAGE BOX WHEN PURCHASING! Lime green or Pink only!